Three macromolecular assemblages, the lid complex of the proteasome, the COP9-Signalosome (CSN) and the eIF3 complex, all consist of multiple proteins harboring MPN and PCI domains. Up to now, no specific function for any of these proteins has been defined, nor has the importance of these motifs been elucidated. In particular Rpn11, a lid subunit, serves as the paradigm for MPN-containing proteins as it is highly conserved and important for proteasome function. We have identified a sequence motif, termed the MPN+ motif, which is highly conserved in a subset of MPN domain proteins such as Rpn11 and Csn5/Jab1, but is not present outside of this subfamily. The MPN+ motif consists of five polar residues that resemble the active site residues of hydrolytic enzyme classes, particularly that of metalloproteases. By using site-directed mutagenesis, we show that the MPN+ residues are important for the function of Rpn11, while a highly conserved Cys residue outside of the MPN+ motif is not essential. Single amino acid substitutions in MPN+ residues all show similar phenotypes, including slow growth, sensitivity to temperature and amino acid analogs, and general proteasome-dependent proteolysis defects. The MPN+ motif is abundant in certain MPN-domain proteins, including newly identified proteins of eukaryotes, bacteria and archaea thought to act outside of the traditional large PCI/MPN complexes. The putative catalytic nature of the MPN+ motif makes it a good candidate for a pivotal enzymatic function, possibly a proteasome-associated deubiquitinating activity and a CSN-associated Nedd8/Rub1-removing activity. Many regulatory proteins are removed from the cell in a timely and specific manner by a large multi subunit enzyme called the proteasome [1, 2]. For proteins to be recognized by the proteasome, they are usually first covalently attached to a polyubiquitin chain via a cascade of ubiquitinating enzymes. This ubiquitination process is reversible. Specific cysteine proteases known as DUBs (deubiquitinating enzymes) can hydrolyze the amide bond between the Carboxy-terminus of ubiquitin and an amino group on the substrate [3, 4]. Proteolysis takes place within the 20S core particle (CP) of the proteasome, while the 19S regulatory particle (RP) binds polyubiquitinated substrates, unfolds, and translocates them into the 20S CP for proteolysis. The discovery that the 19S regulatory particle of the proteasome (RP) can be separated into two discrete subcomplexes, the lid and the base, suggests that they have distinct roles in preparing a substrate for degradation . The base contains six ATPase subunits, Rpt1-6, as well as the two largest non-ATPase subunits Rpn1 and Rpn2, and plays a role in anchoring the substrate, unfolding it and gating the channel leading into the 20S CP [6–9]. The lid complex consists of eight non-ATPase subunits whose functions have not been defined. All subunits of the lid subcomplex contain one of two structural motifs: six contain a PCI domain (Proteasome, COP9, eIF3), while the other two (Rpn8 and Rpn11) contain an MPN domain (Mpr1, Pad1 N-terminal) [5, 10, 11]. These domains are found in members of two other eukaryotic macromolecular assemblages as well: the COP9 signalosome (CSN) and the eukaryotic translation initiation factor 3 (eIF3). The functions of these domains are not known, but they are necessary for proper interactions between subunits of these complexes [12, 13]. The lid appears to be required for the degradation of polyubiquitinated substrates but not for hydrolysis of unstructured or short polypeptides . Thus, one possibility is that the lid is required in one way or another for proper interactions with polyubiquitinated chains. At 66% identity between the human and yeast forms, the MPN domain protein Rpn11 is the most highly conserved non-ATPase subunit of the 19S RP, on par only with the highly conserved ATPase subunits, suggesting that it too may play an enzymatic role within the RP [14, 15]. Mutations in RPN11 cause cell cycle and mitochondrial defects, temperature sensitivity, and sensitivity to DNA damaging reagents such as UV or MMS, underscoring the importance of this subunit in proteasome function [16–18]. Rpn11 is one of a minority of proteasome subunits that exhibit dominant phenotypes upon overexpression. High dosage of human or S. pombe Rpn11 orthologs confer multidrug and UV resistance [19, 20]. These effects may be linked to the stabilization of c-Jun observed upon overexpression of the Rpn11 subunit in Schistosoma, SmPOH1 . In another case, however, overexpression of Rpn11 can suppress an srp1 mutation, the yeast homolog of importin alpha, and enhance degradation of a proteasome substrate , illustrating that effects of Rpn11 are pleiotropic. Together, these results may suggest that Rpn11 embodies an intrinsic enzymatic activity. In order to gain insight into the functions and evolutionary history of MPN domain proteins such as Rpn11, we performed extended database searches using the generalized profile method . An improved MPN domain profile detected a large number of novel significant matches including some prokaryotic proteins from archaeal and eubacterial origins, which until now have not been known to contain MPN domains. In addition to being structurally related to the published eukaryotic MPN domains, all prokaryotic MPN domains contain an additional pattern of five polar amino acids, which are conserved in a highly correlated fashion. This motif is embedded within the conventional MPN domain, and is also conserved in some – but not all – eukaryotic MPN proteins. We therefore term it the MPN+ motif. The polar nature and coordinated conservation of the MPN+ residues suggest a catalytic and/or metal-binding function. Since Rpn11 is one of the eukaryotic MPN domain proteins harboring the MPN+ motif, we used mutational analysis to assess the importance of these conserved amino acids for the function of Rpn11 in S. cerevisiae. Rpn11 also contains a highly conserved cysteine residue that is not part of the MPN+ motif but is present in a number of its close paralogs such as the COP9 signalosome subunit, Csn5. It has been suggested that this may correspond to the active site cysteine of a catalytic DUB motif . Therefore, we also analyzed mutants of Cys116, and compared them to mutations in the MPN+ residues of Rpn11. In order to identify distantly related members of the MPN domain family, we constructed generalized profiles of previously established MPN proteins. Included in the profile construction were the proteasome lid components Rpn8 and Rpn11, the COP9 signalosome components Csn5 and Csn6, and the translation initiation factor 3 components eIF3f and eIF3h, all from various eukaryotic species. After scaling of the profile , significant hits were found in protein database, including the STAM-interacting protein AMSH , and the uncharacterized human proteins C6.1A and KIAA1915. Subsequently, iterative profile refinement  was used to make the profile searches more sensitive. For that purpose, the newly identified MPN proteins were included in the profile construction process. After four iteration cycles, a stable set of significantly matching bona fide MPN proteins was identified. Representative members of this superfamily are shown in Figure 1. The MPN+ motif. Sequence alignment of representative MPN domain protein, only two conserved blocks containing the MPN+ motif are shown. The proteins are grouped in seven categories: A, bacterial; B, archaeal; C, proteasome lid components; D, CSN components; E, eIF3 components; F, Prp8-like proteins; G other eukaryotic MPN proteins. In the eukaryotic groups, representative sequences from human (HS), Arabidopsis (AT), S. pombe (SP) and S. cerevisiae (SC) are shown. Prokaryotic species shown are lambda phage (BPL), Yersinia pestis (YP), Synechocystis sp. (SS), Mycobacterium tuberculosum (MyT), Pseudomonas aeruginosa (PA), Pyrococcus horikoshii (PH), Archaeoglobus fulgidus (AF), Methanobacter thermoautotrophicum (MT). Residues invariant or conservatively substituted in at least 50% of all sequences are shown on black and grey background, respectively. The MPN+ motif residues are shown in red. The top line indicates the amino acids constituting the MPN+ motif; the rightmost column indicates whether a protein is considered an MPN+ protein or a plain MPN protein. In addition to the previously known MPN proteins, a number of prokaryotic members were identified, including the phage tail assembly protein K from the bacteriophage lambda and its closely related homologs from other phages and prophages. Even archaeal members of the MPN domain family were found, including predicted proteins from Archaeoglobus fulgidus, Methanobacter thermoautotrophicum and from various Pyrococcus species (Fig. 1). These proteins are the shortest MPN protein identified so far and most likely correspond to the structural core region of the domain. Since the finding of prokaryotic MPN proteins was highly unexpected, the validity of the assignment was confirmed by profile searches starting from the bacteriophage proteins that resulted in the same stable set of significantly matching proteins. Overall, there are no residues that are invariant throughout the MPN domain superfamily. However, while analyzing the alignment of the newly identified proteins, it became apparent that there are a number of polar residues that are conserved in a highly coordinated fashion in a subset of MPN domains (highlighted in Red in Fig. 1). These amino acids form a pattern, referred to herein as the 'MPN+ motif', which is part of the conventional MPN domain and embedded within it. The MPN+ motif contains a well-defined pattern of 'H-x-H-x-S-x-D', where x and x indicate stretches of seven and two non-conserved residues, respectively. In addition to this conserved arrangement of four polar residues, there is an additional glutamate residue in a more N-terminal region of the domain, whose conservation is perfectly correlated with the occurrence of the motif (Figure 1). An aromatic residue, preferentially a tryptophane, is found two positions upstream of the conserved serine in most but not all MPN+ proteins. Thus, it should not be considered a part of the core MPN+ motif. With the possible exception of Prp8, all MPN domain proteins shown in Figure 1 can unambiguously be classified as either belonging to the MPN+ or to the 'plain' MPN class. The validity of this distinction is underscored by the fact that invariably all observed orthologs of MPN+ proteins also belong to the MPN+ class. For instance, the proteasome lid complex from all eukaryotes contains one MPN+ protein (Rpn11/S13) and one plain MPN protein (Rpn8/S12). The same is true for the analogous CSN complex in multicellular eukaryotes, where the MPN+ protein is Csn5 and the plain MPN protein is Csn6. In fission yeast, Csn6 appears to be absent. The same is true for the recently identified CSN-like complex of budding yeast; it contains only Csn5 but not Csn6 (Hofmann and Glickman; submitted for publication). The two MPN proteins of the eIF3 complex are both of the plain MPN type in multicellular eukaryotes and fission yeast, while in budding yeast they appear to be missing altogether. Notably, all newly identified prokaryotic MPN proteins are of the MPN+ type; the same is true for the remaining unassigned 'orphaned' MPN proteins in eukaryotes (Fig. 1). It should be stressed that the MPN+ motif is not a stand-alone motif to be found independently of the MPN domain; thus, all MPN proteins can be classified as either MPN+ or plain MPN proteins. In order to assess the importance of the MPN+ residues for efficient Rpn11 function, we performed site-directed mutagenesis of His111, Ser119, Asp122, which are part of the conserved HxH–S–D sequence that defines the MPN+ motif. In addition, Cys116, which is not part of the MPN+ motif but is highly conserved between Rpn11 and Csn5 orthologs might be a candidate for an active site residue, was mutagenized too. As seen in Fig. 2, alanine substitutions in the MPN+ motif of Rpn11 cause severe growth defects, temperature sensitivity, and sensitivity to amino acid analogs such as canavanine. Substitution mutations at different locations in the MPN+ motif display similar, but slightly distinct phenotypes. Specifically, the His111Ala mutant is extremely slow growing at 25°C and lethal when plated at elevated temperatures, even as low as 30°C. The Asp122Ala and Ser119Ala mutants are viable but slow growing at 25°C and 30°C, and lethal when shifted to 37°C or when exposed to amino acid analogs. By contrast, substitutions of the conserved Cys at position 116 showed no growth defect, and the cells appeared normal under all conditions tested. Growth of rpn11 Mutants under Different Growth Conditions. WT and mutant strains were streaked on YPD at 25, 30 and 37°C. Cells were also plated on complete minimal media containing 1 μg/ml of the amino acid analog canavinine instead of arginine. Plates were photographed after 3–5 days. Three single amino acid substitutions in the MPN+ motif of Rpn11 were studied: his111ala, Ser119ala, and asp122ala. For comparison, a substitution of a highly conserved cysteine residue (cys116ala) that is not part of the MPN+ motif (see Fig. 1) was included as well. At 25°C, all MPN+ mutations are viable but slow growing. Hiss111 is extremely temperature sensitive, showing no appreciable growth even when shifted to 30°C, or in the presence of even 1 μg/ml of the amino acid analog canavinine. Asp122 and Ser119 substitutions show lethality under elevated temperature (37°C) or exposure to canavanine. In comparison, Cys116 substitutions show no growth defects under these conditions. Stress conditions such as exposure to elevated temperature or amino acid analogs are known to promote accumulation of damaged proteins, which must be removed by the proteasome . Since defects in the MPN+ motif of Rpn11 cause heightened sensitivity to such conditions, it is reasonable to assume that proteasome function is jeopardized in these mutants. We conclude that the MPN+ motif is critical for the proper function of Rpn11 within the proteasome, but that Cys116 does not appear to be an essential residue in Rpn11. In order to test whether proteasome function is indeed hampered in these rpn11 mutants, we checked the effects of mutations on the ubiquitination pattern of cellular proteins. Whole cell extracts from rapidly growing WT or MPN+ motif mutants were separated by SDS PAGE and immunoblotted with anti-Ub antibody (Fig. 3). 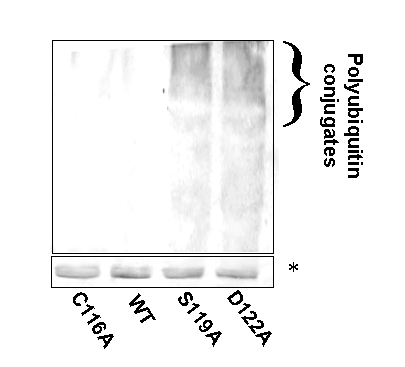 High molecular weight polyubiquitin-conjugates are not detected at appreciable levels in extracts from yeast containing normal proteasomes since they are rapidly turned over. High molecular weight polyubiquitinated proteins do accumulate, however, in rpn11 MPN+ mutants, indicating defective proteasome activity. In this assay, all mutations in MPN+ residues behave similarly. His111 mutants also accumulate polyubiquitinated proteins when grown at 25°C, but since this strain is extremely slow growing it was difficult to prepare extracts for comparison (not shown). No such accumulation is seen in cells containing Rpn11 with Cys116 substitutions. Accumulation of multiubiquitinated proteins in MPN motif mutants. Total cell extracts from WT yeast and from strains containing the MPN+ motif substitutions were separated on an 8% SDS gel and blotted with anti-ubiquitin antibodies. Cells were rapidly lysed in presence of 12% TCA in order to inhibit post lysis enzymatic activity. Accumulation of high MW polyubiquitinated proteins is detected in the Ser119 and Asp122 mutants, but not in WT or in the Cys116 mutants. His111 mutants accumulate polyubiquitinated proteins as well (not shown). A protein band migrating at around 20 kDa that is detected with the anti Ub antibody is used as an internal loading control. It appears that the MPN+ motif defines the role of Rpn11 in the proteasome but that the conserved Cys116 residue is not critical for proteasome function. The steady state levels of polyubiquitin-protein conjugates are influenced by the rate of ubiquitination on the one hand, and by rates of deubiquitination or proteasome proteolysis on the other. Accumulation of polyubiquitinated proteins in rpn11 mutants could therefore be due to a slowdown in either proteasome associated deubiquitination or proteasome-dependent proteolysis. In order to test whether the accumulation of polyubiquitinated conjugates is directly correlated with a defect in proteasome function, we checked whether mutations in the MPN+ motif of Rpn11 bring about stabilization of proteasome substrates. The steady state levels of known short-lived proteins were measured in WT and in a representative rpn11 mutant strain. In order to estimate the generality of the effect, two different substrates were used: a protein that is ubiquitinated by enzymes of the UFD ubiquitination pathway , and a protein that is ubiquitinated by enzymes of the N-end rule pathway . WT Cells, or those harboring the S119A substitution in the MPN+ motif of Rpn11 were transformed with plasmids expressing Arg-β-galactosidase (an N-end rule substrate) or Ub-pro-β-galactosidase (A UFD substrate). Arg-β-gal and Ub-Pro-β-gal are short-lived in wild-type yeast with half-lives of ~2 and ~6 minutes, respectively . Steady state levels of these proteins were compared to the levels of a stable, long-lived protein, Met-β-galactosidase. As expected, WT cells accumulated high levels of the stable Met-βgal but only low levels of the rapidly degraded Arg-β-gal and Ub-Pro-β-gal (Fig. 4). In contrast, the S119A mutation in rpn11 lead to dramatic stabilization and accumulation of both these short-lived proteins, such that the steady state levels of all three substrates were similar (Fig. 4). Stabilization of these short lived proteins was noted also in the D122A mutant (not shown). From these results we conclude that the MPN+ motif of Rpn11 is essential for proper proteolysis of ubiquitinated substrates by the proteasome. The importance of Rpn11 is independent of the ubiquitination pathway. Stabilization of short-lived proteasome substrates. WT and the S119A mutant strains containing the Ub-Met-, Ub-Arg-, and Ub-Pro-βgal constructs on multi-copy plasmids under the GAL promotor were tested for LacZ activity after galactose-induction. LacZ activity is indicative of steady-state levels of the reporter protein. WT cells accumulate high levels of the stable Met-βgal, but rapidly degrade Arg-βgal and UB-Pro-βgal (left panel), whereas the MPN+ mutation shows dramatic stabilization and accumulation of both short-lived fusion proteins (right panel). The possibility that these deficiencies in proteasome dependent proteolysis were caused by improper incorporation of mutated Rpn11 into the lid, or that proteasome structure was hampered in rpn11 mutants was addressed by native gel electrophoresis. 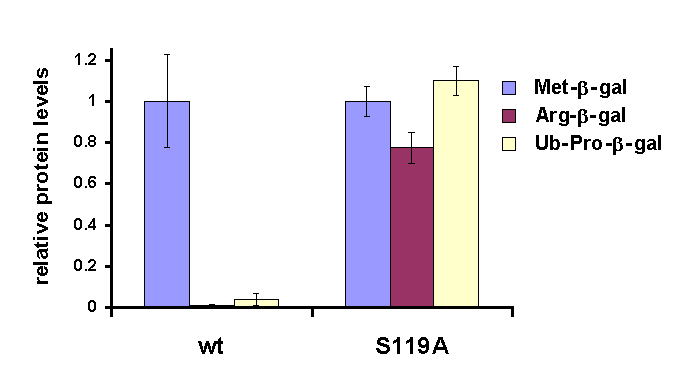 Cell extract from WT and rpn11 mutants was resolved by nondenaturing PAGE and no gross structural changes were observed (Fig. 5). Overall levels and proteolytic intensities of proteasomes from MPN+ mutants were indistinguishable from WT, indicating that the substitutions do not alter the structure of peptidase function of the proteasome. In addition, we found no evidence for natural abundance WT Rpn11 outside of the proteasome (data not shown), indicating that the phenotypes associated with mutated rpn11 are unlikely to be due to unincorporated protein. 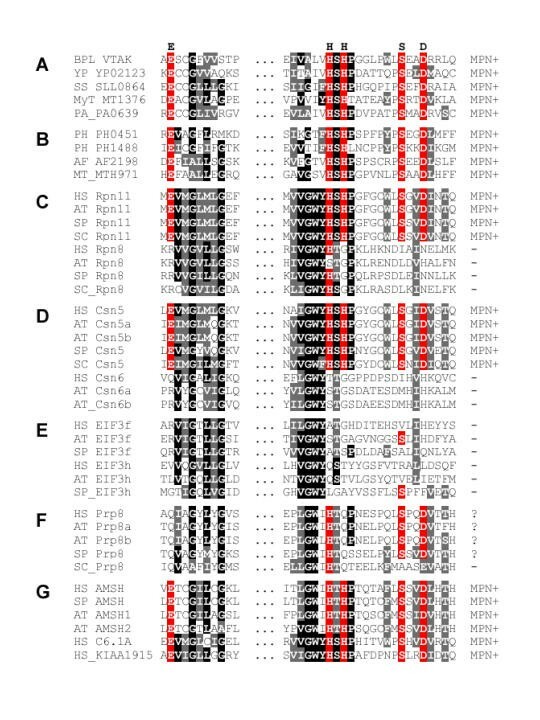 Since peptidase activity of mutant proteasomes was similar to WT (Fig. 5), the effects of rpn11 mutations is most likely due to a defect in proteolysis of ubiquitinated substrates (Fig. 4). Migration pattern of proteasome from WT and rpn11 mutants by non-denaturing PAGE. Cell extracts were prepared from Logarithmically growing WT or the rpn11 MPN+ mutants that were brought to an identical OD600 level. Extracts were clarified by centrifugation, and identical amounts of total protein were separated on native gel. The gel was then incubated for 10 minutes with the fluorescent peptide LLVY-AMC at 30°C, and photographed under UV light (380/440 nm). Fluorescent bands indicate migration of Doubly capped and Singly capped 26S proteasome forms . There is no noticeable change in migration pattern or overall levels of proteasomes from the different rpn11 mutants, indicating that mutated Rpn11 is properly incorporated into the lid and no gross structural changes in proteasome composition or amounts are due to the mutations. We have identified an arrangement of five residues, which are perfectly conserved in a subclass of MPN domains, while none of them shows appreciable conservation outside of this subclass. The highly correlated conservation of these residues suggests that they participate in a common structural element and/or a common function that is critical for the proteins in which they are found. This idea is corroborated by the polar nature of the conserved MPN+ residues: glutamate, histidines, serine and aspartate are all amino acids frequently found in the active site of enzymes or as the coordinating ligands in metal-binding proteins. Certainly, these two possibilities are not mutually exclusive. Several classes of enzymes, particularly metal containing hydrolases and proteases, harbor bound metal ions such as Zn2+ as part of their catalytic center . However, while the motif does bear some resemblance to that found in metalloproteases, the specific organization of E–HxH–S–D residues does not correspond to the metal ligands in any of the known Zinc proteases , thus positive identification of Rpn11 as a metalloprotease awaits definite proof. The proteasome complex from a number of sources is known to contain a ubiquitin hydrolyzing activity [31–39], while the CSN complex is known to cause the hydrolytic removal of the Nedd8/Rub1 ubiquitin-like molecule from the cullin subunit of the SCF ubiquitin ligase (E3) complex [40–42]. Thus, the MPN+ containing subunits of the proteasome lid (Rpn11) and the COP9 signalosome (Csn5) would be prime candidates for such a hydrolytic function. The architecturally related eIF3 complex, for which no such enzymatic activity has been described, is conspicuously devoid of MPN+ proteins. That the CSN from yeast lacks the plain MPN protein (Csn6) retaining only the MPN+ subunit (Csn5), while the plain MPN proteins found in eIF3 from eukaryotes appear to be missing altogether in the yeast complex, emphasizes that the MPN+ residues are likely to be the catalytic residues, with plain MPN subunit playing a redundant structural role in complexes in which they are found. Even though purified recombinant Rpn11 does not appear to exhibit DUB capabilities (data not shown), it is possible that once incorporated into their respective complexes, Rpn11 and Csn5 confer the documented hydrolase activities onto the 19S RP and CSN. In this case, Rpn11 would belong to a unique class of enzymes, as all other known DUBs are cysteine proteases. Of note, the conserved cysteine residue common to both Rpn11 and Csn5, which is not part of the MPN+ motif, is not important for the function of Rpn11. Single site substitutions in various Rpn11 MPN+ residues exhibit similar phenotypes supporting the identification of MPN+ as a discrete functional motif. Due to the severe growth phenotypes and attenuated ability of the proteasome to proteolyze polyubiquitinated substrates in these mutants, it appears that the MPN+ motif defines the role carried out by Rpn11 in the lid. As we show, these defects arise from an intrinsic activity of Rpn11 within the context of the proteasome, and not due to a gross structural effect upon incorporation of mutated Rpn11. As mentioned above, the lid, where Rpn11 is situated, is critical for proteolysis of polyubiquitinated substrates. So far, and somewhat surprisingly, all ubiquitin binding activity has been mapped to the Base of the 19S RP. Two subunits in the base can interact directly with ubiquitin chains, Rpt5 and Rpn10 [5, 7, 43, 44]. A number of proteins, such as Rad23 and Dsk2, can also bind ubiquitin and interact with the proteasome, presumably with the base, thus they are thought to serve as shuttles of polyubiquitinated substrates to the proteasome [45, 46]. It is possible that the lid rather than bind ubiquitin, serves to cleave or trim polyubiquitin chains once attached to the Base. While this manuscript was under review, two independent papers substantiated our findings by characterizing a novel deubiquitinating activity in the proteasome, and showing that the MPN+ motif residues of Rpn11 are largely responsible for this activity [47, 48]. These independent studies identified DUB activity associated with the 19S RP of the proteasome, which is lacking upon lethal substitutions in Rpn11. Interestingly, all substitution mutations that we studied in the MPN+ motif of Rpn11 are viable. Quite possibly, Rpn11 is not the sole proteasome-associated DUB, and a number of DUBs play partially overlapping functions. For instance, Doa4/Ubp4 interacts weakly and substoichiometrically with the proteasome and may serve to release ubiquitin and regenerate the proteasome for the next catalytic cycle . The Ubiquitin-like domain (UBL) containing deubiquitinating enzyme, USP14, has been found to interact with the proteasome from mammalian sources . Ubp6, the budding yeast homolog of USP14, interacts with the proteasome as well , and plays a role in proteasome-associated deubiquitination . It has also been reported that the Drosophila DUB p37a  and its homologs UCH37 (H. sapiens) and Uch2 (S. pombe), may be responsible for the polyubiquitin chain editing function associated with purified proteasomes [31, 34, 35]. However, as budding yeast lacks an obvious ortholog of UCH37/p37a, other DUBs must play a greater role in proteasomes from this organism. Finding MPN+ motif proteins in prokaryotes will help elucidate the origins of proteasome evolution and the function of Rpn11 in particular. The proteasome probably evolved from self-compartmentalized macromolecular proteases found in prokaryotes. Thus, proteasomal subunits, or proteins with motifs related to proteasomal subunits, are present in archaea and certain eubacteria. These "lidless" prototypes include the 20S CP subunits, and homologs of the base ATPases (Rpt subunits) . However, proteins relating to the ubiquitination process, such as ubiquitin itself, ubiquitin activating conjugating or ligating enzymes, and even lid subunits, are missing from prokaryotes. Identification of a motif from Rpn11 – a protein that is linked to processing of polyubiquitinated proteins – in prokaryotic proteins is an interesting development. It is possible that during evolution, the proteasome recruited an existing enzyme as the lid was forming into a regulatory module of the proteasome; likewise for the analogous CSN complex. Studying the prokaryotic MPN+ motif proteins should aid in elucidating what this motif does. The fact that these proteins are the shortest MPN proteins and correspond to the structural core region of the domain should greatly aid in enzymatic and structural studies, especially in comparison to members of the family such as Rpn11 and Csn5 that are naturally found only incorporated into complexes. Interestingly, all identified prokaryotic MPN domains, both from archaea and from eubacteria, also contain the MPN+ motif. It thus appears likely that the ancestral MPN domain was of the MPN+ type, and that the extant 'plain' MPN proteins have lost this motif later on. It is possible that the plain MPN proteins play a structural role in complexes that additionally contain a MPN+ subunit. So far all known MPN proteins are incorporated into complexes that also contain PCI proteins [51, 52]. Interestingly, several of the prokaryotic organisms harboring MPN+ proteins appear to lack PCI domain proteins and therefore probably could not form large PCI/MPN complexes related to the lid and CSN particles. An interesting case is the tail assembly protein 'K' of the bacteriophage lambda (vtak) and its many homologs from other phages and prophages (Fig. 1). Little is known about the specific function of the protein but none of the other tail assembly factors contain a PCI or MPN domain (K.H unpublished results). Our work suggests that the K-protein plays an enzymatic role in tail assembly rather than a merely structural one, although whether the analogy to Rpn11 is relevant to vtak is still enigmatic. A similar situation exists for the orphan MPN proteins of eukaryotes. It is noteworthy that complex eukaryotic organisms have far more orphan MPN protein than orphan PCI proteins. However, the known PCI/MPN complex particles have stoichiometries that require more PCI components than MPN components. This apparent paradoxon can be resolved by a number of different but non-exclusive assumptions. i) Additional PCI proteins have eluded detection due to high sequence divergence allowing for more than three PCI/MPN complexes to exist, ii) alternative MPN proteins can interact with existing PCI complexes, iii) some MPN proteins have (enzymatic) functions outside of PCI/MPN complexes. Currently, there is no data available supporting the first two possibilities, although there is some promiscuity in the PCI protein interactions [52, 53]. The third possibility is likely to be true in prokaryotes and could also explain why all eukaryotic orphan MPN proteins belong to the MPN+ class. This could also explain how supra-stochiometric amounts of Rpn11 exhibit dominant phenotypes; possibly it can function outside of the proteasome as well. The MPN+ motif is abundant in certain MPN-domain proteins, including newly identified proteins of eukaryotes, bacteria and archaea thought to act outside of the traditional large PCI/MPN complexes. The putative catalytic nature of the MPN+ motif makes it a good candidate for a pivotal enzymatic function, possibly a proteasome-associated deubiquitinating activity and a CSN-associated Nedd8/Rub1-removing activity. The importance of the MPN+ motif for the efficient function of the proteasome component Rpn11 is compatible with this idea, though the fact that none of the single amino acid substitutions are lethal indicates that either the function of Rpn11 is not strictly essential for proteasome function, or more likely, it is partially redundant with other subunits. All database searches were performed with a nonredundant data set constructed from current releases of SwissProt, TrEMBL, and GenPept [54, 55]. Generalized profile  construction and searches were run locally using the pftools package, version 2.1. (program available from the URL ftp://ftp.isrec.isb-sib.ch/sib-isrec/pftools/). Profiles were constructed using the BLOSUM45 substitution matrix  and default penalties of 2.1 for gap opening and 0.2 for gap extension. The statistical significance of profile matches was derived from the analysis of the score distribution of a randomized database as described . Database randomization was performed by individually inverting each protein sequence, using SwissProt 34 as the data source. Haploid yeast strain with a chromosomal knock out of rpn11 was constructed, in which a single copy URA-marked plasmid expressing the RPN11 gene complements the chromosomal knock out (MY71). The heterozygote RPN11/rpn11Δ diploid was purchased from EUROSCAF and transformed with a single copy CEN plasmid with URA3 selection (ycplac33) expressing RPN11 from its own promotor (M82). Growth of MY71 was identical to the isogenic WT strain from EUROSCARF. Plasmids expressing the single site substitutions in Rpn11 were generated using PCR site directed mutagenesis on a similar CEN plasmid with the LEU2 marker for selection (ycplac111). In this manner the following plasmids were constructed RPN11 (M134), rpn11-C116A (M134), rpn11-H111A (M143), rpn11-S119A (M144), rpn11-D122A (M145). Those plasmids were then transformed into the above yeast strains, and the URA3-marked WT rescue plasmid was then forced out of the cells by the presence of 5'FOA in the medium. 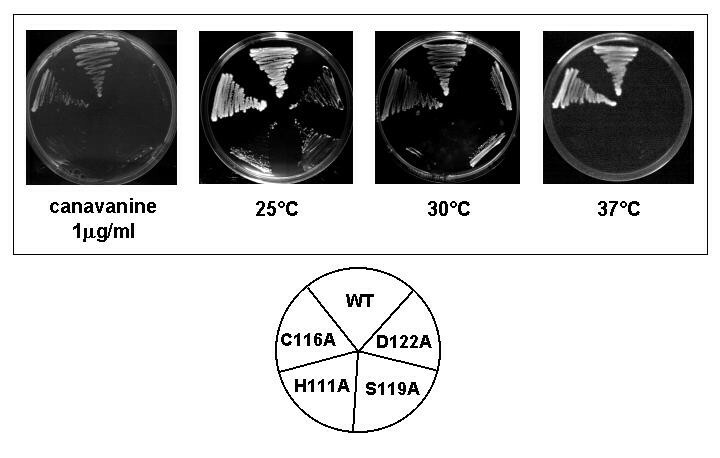 FOA shuffling was done at 25°C as most rpn11 mutants were severely temperature sensitive. 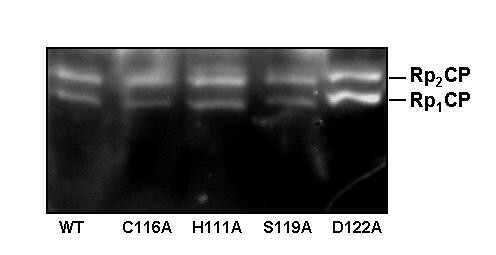 In this manner we got viable yeast rpn11 mutant strains. Single colonies grown on YPD at 25°C were streaked onto YPD and shifted to various temperatures. Plates were photographed after 3–5 days. For canavinine sensitivity, plates containing complete minimal media containing 1 mg/ml canavinine in replace of arginine were used and growth measured at 25°C. Steady-state levels of the Met-, Arg-, and Ub-Pro-βgal fusion proteins were measured by testing LacZ activity . Wild type and rpn11 cells harboring multi-copy URA3-marked plasmids containing each construct were grown to late log in minimal media containing raffinose for carbon source, and induced with 2% Galactose for 4 hrs. The cells were then lysed and LacZ activity upon introduction of the substrate ONPG was calculated when taking into account the time, total protein concentration and amount of product obtained (measured by 405 nm absorbance). Yeast cells were lysed in buffer A (10% glycerol, 50 mM tris7.4, 1 mM ATP, 1 mM MgCl2, 1 mM EDTA) using glass beads, and clarified by centrifugation at 20 × g. Non-denaturing gel was run as previously described . The gel was then incubated for 10 minutes in 10 ml of buffer A and 0.1 mM of the fluorescent peptide LLVY-AMC at 30°C. Under UV light, appearing bands show peptidase activity indicate the migration pattern of the 26S proteasome. We thank Allen Taylor for anti-Ub antibodies. This work was supported by the German Israel foundation for scientific research (GIF), the Israel Science Foundation (ISF), The Israel Cancer Research Foundation (ICRF), a grant for promotion of research at the Technion, a Technion Vice presidential grant, and the Wolfson fund for study of ubiquitin in health and disease. Kay Hofmann and Michael Glickman initiated the project and participated in its design. Kay Hofmann performed bioinformatic characterization of the MPN+ motif (fig. 1). Noa Reis and Vered Maytal designed and constructed the MPN+ amino acid substitutions. Vered Maytal carried out all characterization of Rpn11 mutants shown in Figures 2,3,4,5. All authors read and approved the manuscript.